These pictures capture Lady & Fee, our college’s two French Canadian draft horses, attending and participating in several events in the Fall of 2018. 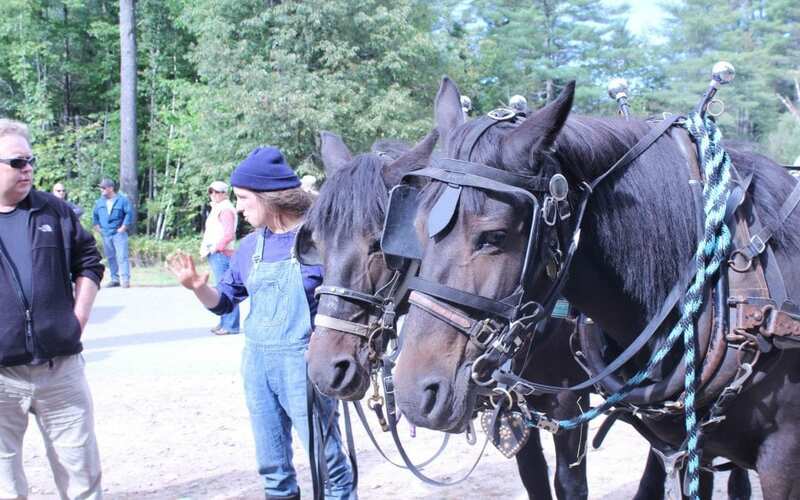 Within the photo stream, you can see both horses giving wagon rides, having their horseshoes replaced, working with students, skidding logs, attending the ADK Rural Skills & Homesteading Festival, demonstrating sustainable logging at the NY State Fair, and showcasing their breed at the Canadian Horse Exposition. “On October 13th, myself and several members from the PSC Draft Horse Club traveled to Harwinton, CT to participate in the French-Canadian Draft Horse Expo. I have always had a passion to work with horses ever since I was young. In bringing our two Canadian draft horses to the expo., I was able to see how capable our horses are, and I also got to spend the weekend surrounded by great horses and people. We started off Saturday morning grabbing a bite to eat and making sure the girls had breakfast too! From there, myself and Stephanie were asked to groom the horses and prepare them for the demonstrations they would be doing later in the day. Sara, the school’s barn manager, then asked for two other members of the club to begin picking the horses hooves and cleaning their stall space. The team was asked to demonstrate for 4 different events. The first event Lady and Fee attended was the Purina Feed and Hay Demo. The second was a round pen arena demonstration using our girls for ground driving. After the round pen demonstration, Lady and Fee were then asked to demonstrate ground driving techniques with novice students. This was the highlight of the whole weekend! Our demo of letting new students ground drive drew in a larger crowd than any of the other demos. And the last demo we participated in was with a professional equissage masseuse. Thank you Madie for your informative journey.